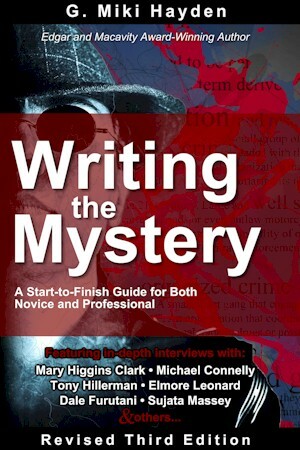 This third edition of G. Miki Hayden’s award-winning guide for mystery writers provides invaluable step-by-step advice on shaping plots, developing characters, and creating a fast-paced and compelling mystery for the modern market. Regular exercises throughout the book help you put into practice what you’ve learned, and once you’ve created your masterpiece Hayden provides guidance on how to get your novel to market: how to approach agents and publishers; how to prepare your manuscript and cover letter; and a whole new section on the self-publishing phenomenon that has exploded since the publication of the first edition. Hayden also offers tips and advice from some of the biggest names in modern mystery, through interviews with such renowned authors as Mary Higgins Clark, Tony Hillerman, Rick Riordan, and others. G. Miki Hayden is a long-time member and former board member of Mystery Writers of America, and regularly teaches a mystery writing workshop (and other courses) at Writer’s Digest online university. She has recent novels from Portals Publishing and from Curiosity Quills Press, the current publisher of her style guide, The Naked Writer. She has had many short stories in print over the years in national publications. Her story “The Maids,” set in French-ruled Haiti and featured in an MWA anthology, won an Edgar. Hayden's Writing the Mystery: A Start-to-Finish Guide for Both Novice and Professional received overwhelming support from mystery professionals and was nominated for an Agatha, an Anthony, and a Macavity, winning the Macavity. It's important for any author to make an investment in themselves by buying books on writing. For the aspiring mystery author, Hayden's book is the logical first investment because it introduces you to the full scope of the mystery world.